Toy Fair 2004: JAKKS Pacific is granting wishes for Dragonball fans! Cell Games Saga on DVD! Brangeta's preview of things to come from Japan! At AOU (a Japanese video game industry show) a new series of DBZ stomp cycles were shown by Banpresto. 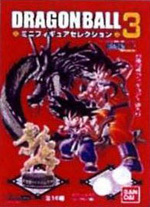 Two versions were shown, a blue cycle with Goku and a red cycle with teen Gohan. These are due in September. Also shown is a new set of DX figures featuring Bulma in a camo bikini top with a mini Goku and nice Lunch in her “training gear” with a mini Master Roshi. These are due in July. The cycles can be seen here and the girls here. Also check out Banpresto’s amazing Dragonball booth display. I’ve just received confirmation from JAKKS Pacific that the Dragonball basics line has not been cancelled; however, the emphasis this year will be on Dragonball Z and Dragonball GT, meaning that it may be a while until we see new 5 inch Dragonball figures. JAKKS Pacific is running strong with Dragonball, and plans to keep the line strong through all of 2004! Their showroom, while not as extensive as in previous years, featured previews of many new figures, a few expected, big-ticket items, and some surprises! All of the images from JAKKS are available in our Toy Fair Gallery. JAKKS is planning on releasing a new line of basic figures every two months; since DBZ series 15 is hitting stores now, expect DBGT series 2 in April, DBZ series 16 in June, etc. Other than the announced lineups and what was on display in the showroom, JAKKS as of yet is not committing to any specific figures. The “Father & Son” two pack is definitely still in the plans (which, to spell it out, means that it is NOT cancelled), though they had nothing from it on display in the showroom. We got a first look at the new Dragons, and they both are astounding. JAKKS is producing both regular Shenlon from Dragonball Z, and Red Shenlon from Dragonball GT! Each Dragon comes with a kid Goku figure (red gi for Z, blue gi for GT), as well as seven dragonballs, for $14.99. JAKKS is keeping a tight lip on their planned MC figures; however, they had two new figures on display, from movie 9! The first was a new Super Saiyan Gohan figure (which I mistook for Goku on first glance), and following that is the villain from movie 9, Bojack! The Bojack on display is not a final product, and the paint applications are still being nailed down, but the sculpt is wonderful, and it was a big surprise to see him there. The Dragonball Chibis are a new line of super-deformed, Japanese-style figures, which will come in a gashapon-style capsule, for $2.99 each. Series 1 features Goku, Vegeta, Frieza, Buu, Trunks, Super Saiyan Broly, and Goku from Dragon Ball Z, and Super Saiyan 4 Gogeta, Goku, Vegeta from Dragon Ball GT. The figures will come both packed individually, as well as in three packs, packed like tennis balls. Brolly will be a chase figure. JAKKS is producing a Dragonball Z TV Game!. The joystick will be shaped like Shenlon, and it will include 3games. Finally, JAKKS Pacific’s collector’s briefing ended with a bang – they gave each attendee a goody bag with an exclusive Toy Fair figure from each boys figure line! The Dragonball exclusive was a series 15 Vegeta figure, in a special package with an exclusive gold Vegeta Chibi! The chibi has a Toy Fair 2004 stamp on it, and is 1 of only 100 pieces. Only 100! And you’ll have a chance to get one, as we’re giving one away as a prize for our upcoming Scene Stealers II contest (check back for rules and dates after the 23rd)! FUNimation has no word on the status of the Dragonball movie. Though JAKKS Pacific has the master toy license for the Dragonball anime series, that does not necessarily translate to a master toy license for any movie property. So, while it’s probable that JAKKS will do any action figures from the live-action movie, if it’s made, it’s not a done deal at this point. According to representatives, FUNimation is “always pushing for a new [Dragonball] series” from Toei. We spoke a bit about the resurgence of Dragonball in Japan, and both had already come to the conclusion that a new series is more likely in Japan than it has been for a long time, though only time will tell. When asked about the possibility of JAKKS Pacific possibly working with Bandai Japan to import some of the new Japanese Dragonball figures, representatives gave a firm “no comment.” I don’t see this as a real probability, so it’s nothing I would count on. JAKKS is really doing the Dragonball series justice by giving the fans just about everything they’ve asked for, and they’re dedicated to keeping the line going as long as they can. We, as Dragonball fans, are very well off with our master toy licensor. We’ve just returned from the JAKKS Pacific Showroom! I’ll be doing a long write-up this evening, but for now, check out all of the images! Check out two new Dragonball GT bobbleheads by NECA! Dragon Ball®: For the first time ever in the history of the Dragon Ball® franchise — dragons! JAKKS introduces DragonBall GT® Dragons and Figures featuring dragons over two-feet long paired with exclusive Dragon Ball Z and Dragon Ball GT figures, just like on programming! New action figures, and playsets based on Dragon Ball® and Dragon Ball Z® will also debut at Toy Fair, with some featuring Japanese stylized sculpts. FUNimation has recently released, for the first time ever, Cell Games Saga on DVD with collectible Starter Box! Tons of fans have asked, “Will the entire Cell Games Saga be released on DVD?” FUNimation’s answer: “Of Course!! !” FUNimation has released the Dragon Ball Z Cell Games Starter Set including DVD 48 & 49. The Box is to be completed with each additional release of the saga. Look for Dragon Ball Z DVD 50: Guardian’s Return on 3/23/04! Go to your local retailer today to get the DVDs that will complete your Dragon Ball Z Collection before the collectable box runs out! Brangeta’s preview of things to come from Japan! Fighting crime never looked so good! FUNimation has just launched their official website for Kiddy Grade, at http://www.kiddygrade.tv. Kiddy Grade DVD Volume 1: Peacekeeper will be available from retailers on February 10th, and Volume 2: Pieces of the Past will be available on March 23. DBGT is currently airing at 6:30 pm EST on Fridays on Cartoon Network, but is moving to Saturdays starting 3/6/04. Beginning Saturday, March 6th, Dragon Ball GT will air on CARTOON NETWORK at 9:30 PM (EST). Be sure to tune in the entire month of March and into April, as Dragon Ball GT will begin airing Episode 21, The Source of General Rilldo’s Power. News from the Hong Kong Toyfair! By this fall, basic figures will have additional action accessories. Shenron the Dragon will come in two versions: Red in the Gt version, and Green in the Z version. Dragonball Z Chibis - these are SD mini-figures packed in Gashapon-like transparent balls. You can see through the balls, and therefore pick the characters you like. Basic 5” figures will include a base. A 12” poseable Jagun Hiei was displayed. 7” figures will continue and include a base and light-up features.